This month for the Daring Bakers’ Challenge we were asked to make “Ensaimda” which is a Spanish Pastry that resembles a snail, hence my decision to call them Coiled Bread Rolls. It was mandatory that we used the recipe provided, but I deviated slightly. I am sure Google will not approve of a bunch of recipes suddenly appearing on the internet all in one go which are exactly the same. I could have used a sweet filling but this did not excite me too much. I wanted to take the base recipe, which is for an enriched dough, and add a savoury note to it using some nigella seeds I have had in my kitchen since June 2012! I found them while on a trip to Scotland and only when I was watching the third season of The Great British Bake Off did I get some inspiration to use them in rolls. 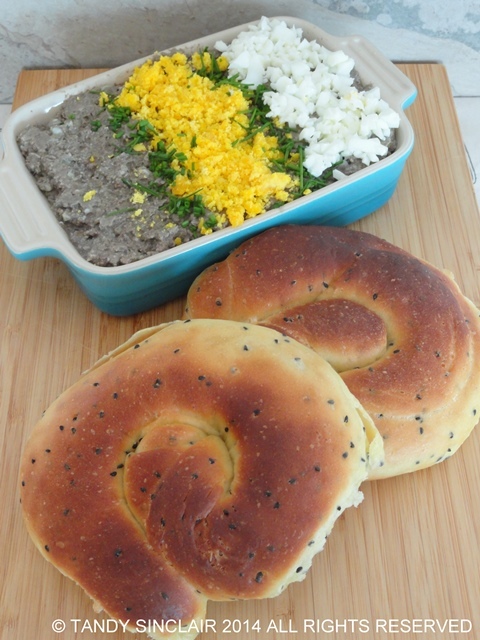 At the same time as I made these coiled bread rolls I made a batch of chopped chicken livers. We had this for lunch over the weekend and the rolls added the perfect note to the chopped livers. They are rich and the nigella seeds impart a crunch of onion that is amazing. I took the left over rolls to work and had one with boiled eggs. I was so glad I had made the changes as the rolls worked out perfectly for my work lunch as well. The coiled bread rolls are easy to make and I hope you give them a try. Hi Tandy, so smart to make the changes that you did, beautiful pics! These rolls do look easy to make! Wish I could smell them cooking in my oven right now. And they’d accompany just about any soup or stew perfectly. Hot out of the oven of course. Love the coiled look. they look really lovely and yummy. Tandy, I love your savory twist to the ensaimda, Love it. Looks so delicious, soft and big and that is important when I am feeding hungry boys. They would devour these with ease! And they look pretty as a picture to boot!